Today’s word is “Paraplegic” sent to us by Gus Johnson! This week, Mat uses an unorthodox method to get out of a sticky situation, Andrew stands up for wheelchair puns, Dan gets complimented by multiple voicemail callers, and Mélissa teaches us how to use tampons. The song at the end of today’s show is Jack’s Wheelchair Song by the Wiggles! This is a project Mat has had on the go for the last year, off and on. You’ll only find the song here. If you want to hear the gang pick silly adjectives, verbs, and nouns, you can listen to the full thing here. Thanks so much for another spooky Halloweenathon! 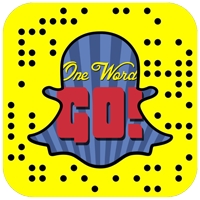 Stay tuned for a return to form with more classic One Word, Go! This is a project Mat has had on the go for the last year, off and on. Today, the gang picks silly adjectives, verbs, and nouns, then jams them into a classic Halloween song. If you don’t want to sit through all the word-picking, here’s where you can listen to the full song without all of the other stuff. Every year, we rip off Are You Afraid of the Dark? by scouring the web for spooky stories and presenting them to each other in an attempt to be accepted into the coveted Midnight Society. This time, can Andrew make his way into the club using a story he found on the same website as Mat? All October (and part of November) long, we’re posting spooky Halloween specials and episodes! Subscribe in Apple Podcasts so you don’t miss a thing!